Of all the Hollywood movies that have made the leap to slot gaming, Psycho is perhaps the most surprising. It's the creepy tale of a motel owner who terrorises his guests. As we say, perhaps not obvious source material for a slot title! But NextGen Gaming makes the Psycho slot machine work with a lucrative free spin round and wilds that pay out fantastic sums of money. 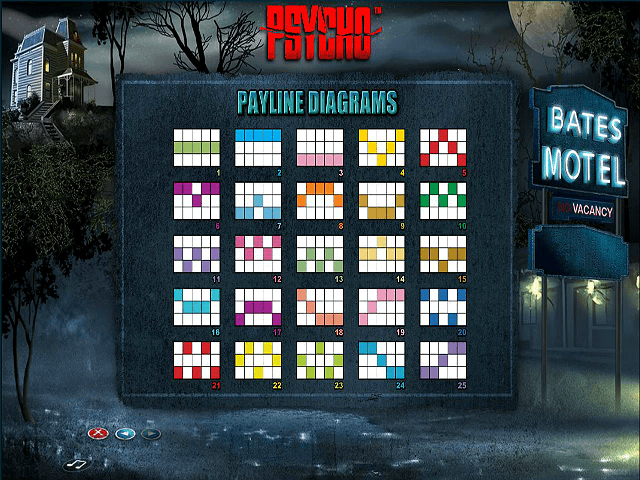 Play Psycho Slot Demo for Free! Play Psycho for Real Money! As you can see, the main game pay-outs in the Psycho online slot are handsome. The only aspect of the game that players can modify is the bet amount – those 25 paylines are set in stone. But the stake can be anything from 0.25 to 62.50. A fun extra in the Psycho slot game is the Gamble feature. After each win you can choose to gamble in an attempt to double or quadruple your pay-out. Simply select the suit or colour of the playing card, and if this is correct your prize will be subject to a two-times multiplier if you guess the colour right and four-times for the suit. 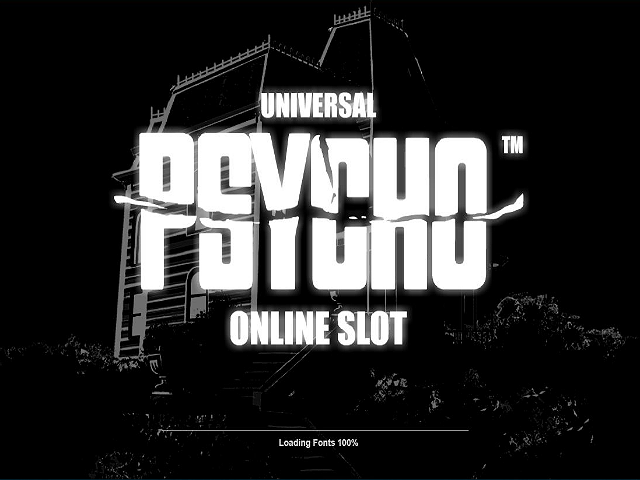 There are two additional symbols in the Psycho slot to watch out for (not to mention Norman Bates lurking in the shadows). First up is the wild, which pays out rather nicely for matching two or more on a payline, with up to 1,250 coins available for landing five. The wild also substitutes for all other icons apart from the scatter, with ‘wild wins’ subject to a multiplier of up to 20-times. The scatter meanwhile, which is the ever-spooky Bates Motel, pays for landing two-five anywhere on your reels, while three or more trigger the free spins feature. Three scatters earn ten free spins, four award 15 and five deliver 20 freebies, and in the free spins round additional wilds appear on your reels (they are actually ‘slashed’ on to your gameboard by a knife-wielding Bates). 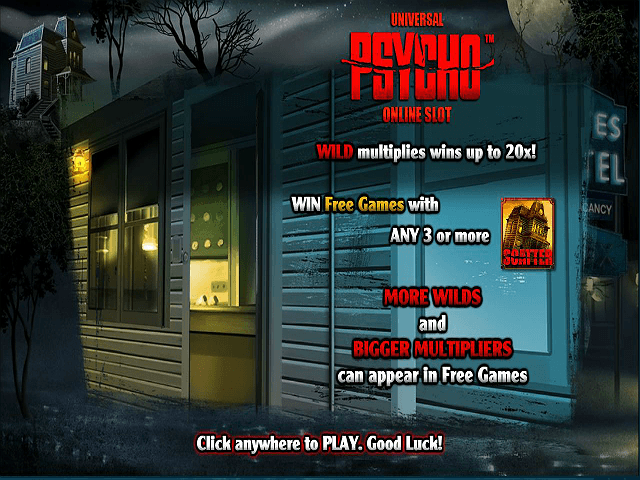 The multiplier available on wild wins here can be a maximum of 40-times. 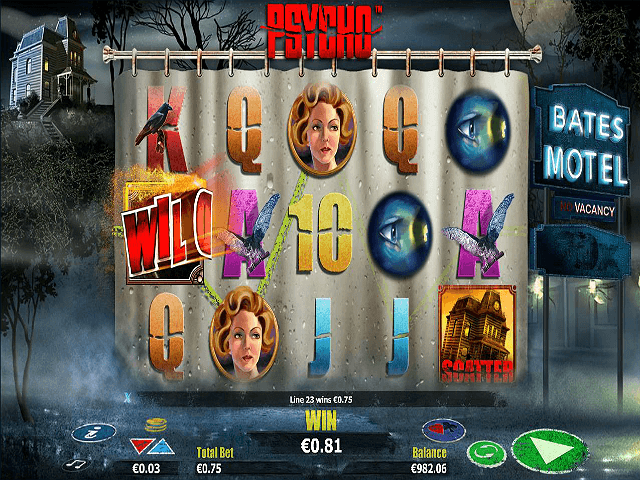 We reckon you’ll be willing to spend a night at the Bates Motel in order to get your hands on the bounty on offer in this Hitchcock-inspired online slot. Share this Psycho Review today! 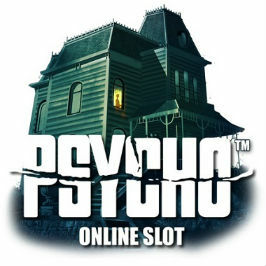 If you like Psycho, you'll love these slot titles too!